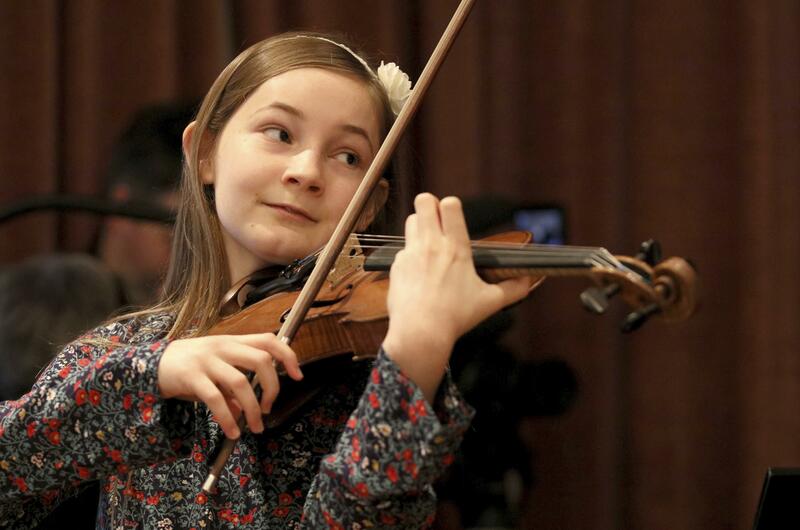 Thu., Nov. 24, 2016, 7:25 a.m.
VIENNA – Alma Deutscher is a composer, virtuoso pianist and concert violinist who wrote her first sonata five years ago and whose first full opera will have its world premiere next month – and she’s only 11. Time-worn associations with Mozart, who wrote his first symphony at age 8, may come to mind. So can questions whether Alma’s unique talent could get in the way of a happy childhood. But fresh from rehearsal, Alma laughs dismissively. When not living music, the child prodigy from Dorking, England, is busy scraping her knees climbing trees, meeting friends on the playground, swimming and many other activities that an 11-year-old would enjoy. But when focused on her passion, she’s all business. Rehearsing “Cinderella” recently, Alma gave instructions and sang phrases in a clear child’s soprano, switching from piano to violin and back as she accompanied the soloists. It all seemed effortless. But the slight child in the red woolen tights and floral print dress was clearly in charge – and enjoying running the show. The energy doesn’t stop flowing off stage. Alma doesn’t even try to sit still, gesturing and fidgeting as she talks about “Cinderella.” She says she’s “extremely excited” at the prospect of the Dec. 29 premiere in the ornate theater of Vienna’s Baumgarten palace. Her father, Guy Deutscher, remembers her “singing almost before she started speaking” – and one day, coming home from a toddlers’ party singing a nursery rhyme in perfect pitch. Drives to the supermarket turned into tests of will, he said. Alma, normally “an extremely good-natured girl,” started screaming if her parents tried to get out of the car while music she loved was still playing. Deutscher describes parenting Alma as a challenge with huge rewards. Alma recalls falling in love with music sometime after age 2. It was a Strauss lullaby, she says, and she was dumbfounded. The music comes unbidden, says Alma. “If I try to sit down and think, ‘now I must get inspiration,’ then I just don’t get inspiration, it doesn’t come to me,” she explained. Future plans include a piano concerto and a symphony. She has started a book that she wants made into a film, complete with her own score. Alma says it features ghosts riding “night mares” and poisoning dreams by breathing toxic fumes. For now, the main focus is on “Cinderella,” delightful not only because of lovely melodies that sometimes draw on Mozart and other classical composers but also because of a charming twist to the familiar story. Alma’s heroine is a composer, “a bit like me.” The step-mother is an opera director, the two step-sisters are haughty divas. And the prince is a poet who finds Cinderella through a melody she wrote. She freely acknowledges that she stole the most beautiful aria from someone else but says “Antonin Yellowsink” doesn’t really mind. Published: Nov. 24, 2016, 7:25 a.m.